Samsung Galaxy S3 sync with Outlook via Google account using Sync2. Outlook and Samsung Galaxy S3 sync via Google. Samsung Galaxy S3 Outlook synchronization by using Sync2. Sync2 makes Android Outlook synchronization much easier for all Android users. If you are using Samsung Galaxy S3, synchronize Outlook with Galaxy S3 easily via a Google account. Start Samsung Galaxy S3 Outlook synchronization by setting up Sync2 synchronization profile. After the setup is completed, the software will automatically synchronize all the latest updates from your Outlook to Google and vice versa. Make sure all changes will be visible on your Samsung Galaxy S3 device, by configuring Gmail account synchronization settings on your phone. Samsung Galaxy S3 synchronization options. There are many options available with Sync2 for Samsung Galaxy S3 Outlook sync. You can set up manual or automatic synchronization between your Outlook and Google accounts and schedule synchronization at a specific time. Keep your Samsung Galaxy synchronized even when Microsoft Outlook is not running. After the synchronization se the Outlook data on your Samsung Galaxy S3 will always be up to date. Sync2 will transfer only the latest changes in your Outlook between multiple devices. It means that Sync2 will perform synchronization only after you make changes in Outlook or Google folders. You can also select one-way or two-way synchronization and transfer changes from Outlook to Google or vice versa in a preferable way. 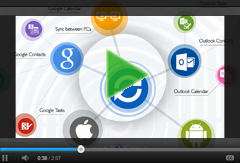 Learn how to sync Samsung Galaxy S3 with Outlook. How to sync Outlook with Samsung Galaxy S3? By using Sync2, Samsung Galaxy users can keep Outlook Contacts and Calendar appointments synced with their smartphone via their Google account. Use simple steps to sync Samsung Galaxy S3 with your important Outlook data. All you need is to set up a Google account on your Android phone. Samsung Galaxy S III synchronization via Google starts from syncing your Outlook data with the Google account. After installing Sync2 on your computer, set up a synchronization profile in Sync2 and select particular Outlook data to sync. Learn how to do it - demo video. The synchronization will start automatically once you finish the synchronization setup wizard.